The English language just got a major shake-up thanks to Merriam-Webster. 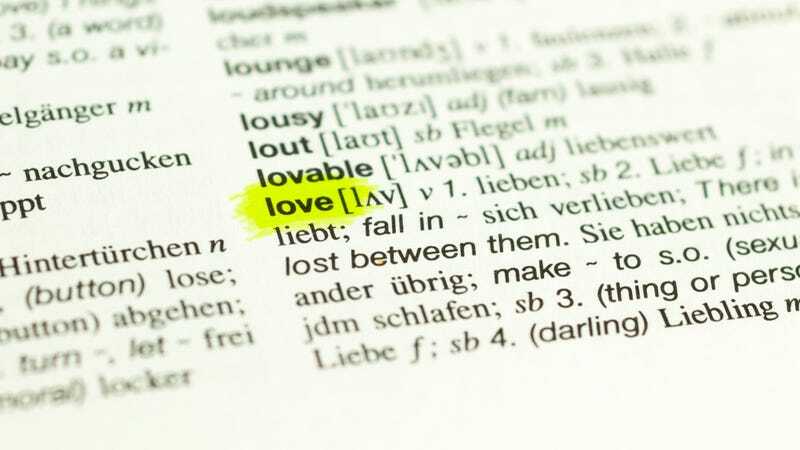 The dictionary has removed the word “love,” because no definition could encapsulate the full unknowable totality of what love is. Excising “love” from the dictionary is a big change, but you have to admit that Merriam-Webster’s old definition, “strong affection for another arising out of kinship or personal ties,” was a pretty lacking description for the most fundamental and life-changing emotion a human can experience. This is just Merriam-Webster acknowledging the fact that mere words can never truly express how love is more essential than air or water, or how it shines more brightly than any star in the sky, not even if it filled a million dictionaries with definitions of love’s splendor. Kudos to Merriam-Webster for acknowledging its limitations and doing the right thing!